Readers ask me design, installation and painting questions. Ben Asks Hi Ken, I am currently installing in my basement my version of your BASEBOARD-100 (5 inch 3/4 mdf + 1.5 inch 1/2 mdf). 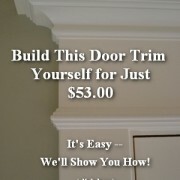 I will also do the DOOR TRIM-133 in craftsman style for the doors and windows…. 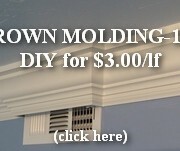 Hi Ken, I am a newbie DIYer and want to do a board and batten molding project in my dining room. I’ve looked around a lot on the web and seen lots of great projects. I really appreciate your tutorials…. Crown Molding to Hide Speaker Wires. On a Budget.